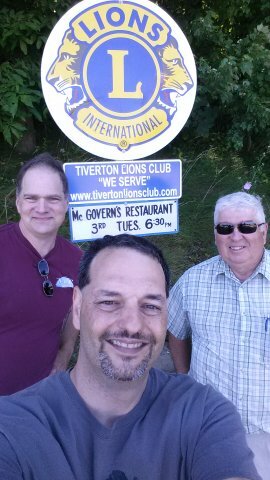 Lions Jeff, Dave and Bob (l-r) put up a new sign off the route 24 ramp entering Tiverton. Tiverton Lions charitable purposes including: Tiverton Student Scholarships, Tiverton families in need, RI Lions Sight Foundation, Rl Lions Cancer in Children Fund, Lions Club International Foundation and more. We helped 46 families in 2017 for the holidays with Stop & Shop gift cards and those with children we added WalMart gift cards. We support the RI Lions Sight Foundation, helping support visually-impaired children at a summer and winter camp, and we support visually-impaired adults on an annual fishing trip. We support the RI Lions Cancer in Children Fund which helps with items that insurance doesn't provide for: wigs for children with cancer, transportation costs to/from the child's doctors appointments, to Boston and baby-sitting costs for the families. We help in a number of ways, please consider joining! Drop off your used eyeglasses for recycling to help those in need. Think you might want to become a Lions Club member? Come to a meeting as our guest. Meet people just like you who make a difference in the community!